Evidence syntheses may benefit from using aggregated clinical trial information in approval documents published online by the US Food and Drug Administration (FDA). We provide practical guidance on how to access and use this source of information for evidence syntheses on treatment effects of drugs and therapeutic biologics. Overall, such examples illustrate that unpublished FDA trial data have the potential to change the results of evidence syntheses and can provide useful information that would otherwise be unavailable.68 It may help to better understand the strengths and weaknesses of a trial that only a regulator could discover, given the regulator’s access to the original study data and the original trial protocols (drug developers must submit the trial protocols before they initiate the approval trials9). The sheer amount of information encountered in an FDA approval document, usually hundreds of pages not following the typical structure of medical journal articles, may indeed confuse and discourage reviewers from using them for evidence syntheses. We have used FDA approval documents in meta-epidemiological projects, including an ongoing analysis of 92 anticancer agents approved by the FDA between 2000 and 2016. Here, we share our knowledge and describe how we navigate such documents efficiently. We also indicate where one can expect to find information typically relevant for evidence syntheses. The target users of this guide are mainly authors of evidence syntheses who intend to collect and synthesise evidence on a given topic in a systematic and transparent manner, such as in systematic reviews or meta-analyses. This guidance can assist in identifying potentially unpublished drug trials, obtaining additional information that is unavailable from published clinical trial reports, or for cross-checking information reported in journal articles. However, it does not cover the subsequent indispensable steps of evidence synthesis including the quality assessment, for which further detailed guidance would be needed. We describe the structure and content of FDA approval documents based on our experience from various meta-research projects, including the ongoing CEIT-cancer project in which we evaluate the evidence base from pre-marketing clinical trials of 92 anticancer agents. In this project, we systematically acquire FDA approval packages, peruse approval documents, and extract trial characteristics as well as treatment effect estimates. In addition, we pilot tested the applicability of our guidance for several drugs approved for neurological, cardiovascular, psychiatric, endocrine, and rheumatological disorders and can confirm its validity across medical specialties. Approval packages are available for prescription and over-the-counter drugs as well as “drug-like” agents (such as therapeutic biologics, which include antibodies, cytokines, growth factors, enzymes, and immunomodulators). For a detailed list of what is included in the drugs@FDA database, look in the “frequently asked questions.”25 Approval documents are only sporadically available for drugs approved before 1997, and are rarely available for supplemental indications (that is, indications approved after a drug has received its initial marketing authorisation). Approval documents for devices and non-therapeutic biologics (such as vaccines, blood, and blood products) are not regulated by the CDER and are not addressed by this guidance. We provide guidance on determining whether FDA approval packages are available for a given drug of interest and how to find the corresponding FDA approval package in the supplemental material on bmj.com (“Part 1: How to access FDA approval packages”). We are aware of about 20 different document types included in FDA approval packages (box 1). The medical review is typically most relevant for evidence syntheses. The medical reviews (sometimes referred to as clinical reviews) usually contain sufficient information for identifying and selecting pertinent trials as well as main information about clinical trial characteristics, statistical analyses and results. However, some important details may be revealed only after thorough perusal of the entire approval package. Since 2016, the medical review document of recently approved drugs is often merged with other document types in a single “multi-discipline review” document. Its content can now be found under the table of contents heading “Statistical and clinical evaluation.” If the medical review document is missing, incomplete, or illegible, or when more in-depth analysis is required, the other documents available in the FDA approval package may provide further information (see below). The medical review document structure has evolved over the years, but we identified three general document structures (fig 1) used since approximately 2004. For older drugs and biologicals, there is no such consistent document structure. The actual document structure may deviate slightly from these general structures, such as by section heading (thus, the section “Review of efficacy” may be titled “Efficacy evaluation” or “Integrated review of efficacy”); grouping of information (for example, section “Clinical pharmacology” may be a subsection of “Significant issues from other review disciplines” or it may exist as a standalone section); or sequence of sections. We generally suggest that reviewers first try to locate the table of contents (some older reviews may have none) and make themselves familiar with the document structure. Sometimes there may be two tables of contents in a medical review document. This may indicate that the original application for marketing authorisation was declined by the FDA and that the agency re-evaluated the drug in a second review. Triptorelin (Trelstar) is such an example (with tables of contents on pages 2 and 41).26 In this situation, both medical reviews should be scrutinised because the data may differ between the two. Whether to use the superseded or the updated version can only be decided in the context of the research question. An explanation why triptorelin was approved only after a second review cycle can be found in the regulatory history, usually described in sections titled “Introduction,” “Background,” or similar (fig 1). Trials submitted to the FDA to support approval are presented and discussed in detail in the purple highlighted sections in figure 1. There is typically a tabular overview with brief information on individual trials such as the target population, interventions, comparators, outcomes, time frame, setting, and study design. Many trials have multiple trial names or identifiers (for example, C0743T09 and PHOENIX 2 in the case of ustekinumab (Stelara) (see medical review page 17)27 and CLEOPATRA, TOC4129g, or WO20698 in the case of pertuzumab (Perjeta) (see medical review page 30)28). Knowing all trial identifiers may facilitate locating the corresponding record on clinicaltrials.gov or identifying reports of trials published in journals. For example, the pivotal trial of ustekinumab can be found as “PHOENIX 2” on PubMed but only with detours on clinicaltrials.gov, whereas it can be quickly found with its identifier C0743T09 on clinicaltrials.gov but not in PubMed. The purple highlighted sections are comparable with the methods section in medical journals in terms of content, with information on trial design (objectives, geographical distribution of sites), trial population (eligibility criteria), interventions, trial endpoints (definitions, outcome assessment), and statistical methods (sample size, calculation of effect estimates, and details on interim, subgroup, and sensitivity analyses). Excerpts from trial protocols and a history of protocol amendments may also be found in these sections. They allow, for example, assessing pre-specification of endpoints or subgroups. 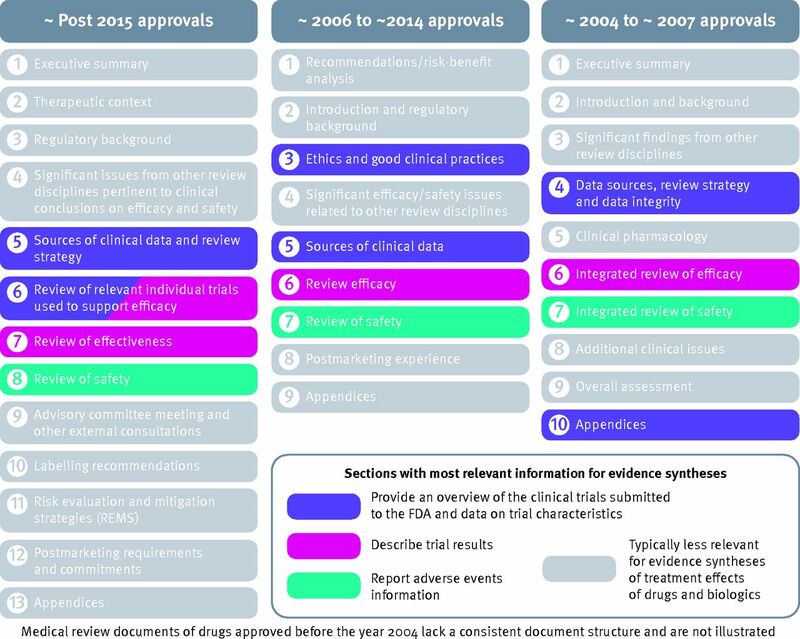 For drugs approved before 2007, additional information about trial methods (and results) may be available in the appendix (fig 1). Results for efficacy endpoints are reported in the pink highlighted sections in figure 1. The sections start with details of the trial population and enrolment, often including a flow diagram, site-specific enrolment information, and summary statistics of patient characteristics. Not all trials presented in the purple highlighted sections (fig 1) have results, either because they are of no relevance for drug approval, they are ongoing, or they address a different indication. Such trials may still have been used to evaluate the drug’s safety profile and to better understand the risk for adverse events. The methods and results of the safety review are presented in the green highlighted sections (fig 1). We provide a step-by-step instruction (including a working example) on where to find relevant clinical trials and their characteristics in the supplemental material on bmj.com. Results for various endpoints from several pre-specified and exploratory analyses are presented in the results section of the medical review. The decision about which one to choose should be made depending on the research aims. We present some general examples of the various types of analyses reported in medical reviews to facilitate pre-specification of the extractions and analyses of interest (box 2). We provide a step-by-step instruction (including a working example) on where to find trials results in the supplemental material. Sometimes there are comments by the FDA medical or statistical reviewer which may be informative for the assessment of the quality of evidence—for example, to address potential risks of bias or to discuss the adequacy of comparator interventions. Schroll and colleagues reported that, in their systematic sample of drugs approved between 2011 and 2012, “crucial information about safety concerns and nonapproved indications were redacted in the FDA reports.”15 Therefore, utmost attention and careful evaluation on a case by case basis is required to assess potential biases resulting from incomplete information. In this regard, a close evaluation of the concerns of the various FDA reviewers in assessing efficacy and safety may provide valuable information. Drugs approved before 2007 are more prone to suboptimal reporting. Options to deal with missing information for outcome data include indirect calculation of effect estimates of time-to-event endpoints (for example arm-specific number of events, point estimates, P values, Kaplan-Meier curves),3132 and juxtaposition of the FDA approval document information with corresponding trial reports in published journal articles, trial registries (such as clinicaltrials.gov), or material from other approval agencies. This guidance aims to reduce barriers to use this evidence by making access and navigation easier. However, important questions remain about how to best integrate this valuable source of information into evidence syntheses. We touch only briefly on crucial subsequent steps of evidence synthesis, for which further detailed guidance is needed. In particular, thorough assessment of the quality and potential biases of the information provided in approval documents is indispensable. Overall, we believe that, despite such limitations, the consideration of approval documents can strengthen evidence syntheses of drug interventions. Re-analyses by the FDA and comments of the different FDA reviewers may provide valuable insights for quality of evidence assessment. Parts of this article were presented at the Evidence Live conference in Oxford UK (June 21-22, 2017) under the title “Assessing drug intervention effects with published FDA approval summary documents: an experience report and practical guidance.” We thank two colleagues at the University Hospital and University of Basel (Dominik Glinz, Basel Institute for Clinical Epidemiology and Biostatistics, and Christopher Traenka, Department of Neurology) for pilot testing the tutorial. Contributors: AL wrote the first draft with input from LGH, and all authors made critical revisions to the manuscript. All authors read and approved the final version of the paper. LGH and BK obtained funding for this study. AL and LGH are the guarantors. Competing interests: All authors have completed the Unified Competing Interest form at www.icmje.org/coi_disclosure.pdf. All authors declare no financial relationships with any organisation that might have an interest in the submitted work in the previous three years and no other relationships or activities that could appear to have influenced the submitted work. Funding: This project was supported by the Swiss Cancer League (Grant No KLS-3587-02-2015). The Basel Institute for Clinical Epidemiology and Biostatistics is supported by Stiftung Institut für Klinische Epidemiologie. None of the funders/sponsors had a role in the design and conduct of the project; in the preparation, review, and approval of the manuscript; or the decision to submit the manuscript for publication. Transparency: The corresponding author affirms that the manuscript is an honest, accurate, and transparent account of the study being reported; that no important aspects of the study have been omitted; and that any discrepancies from the study as planned have been explained. OpenTrialsFDA. OpenTrialsFDA: an interview with Erick Turner. Secondary OpenTrialsFDA: an interview with Erick Turner 2016. https://opentrials.net/2016/10/05/opentrialsfda-an-interview-with-erick-turner/. The Cochrane Collaboration. What's new in the Cochrane Handbook? Secondary What's new in the Cochrane Handbook? http://training.cochrane.org/whats-new-cochrane-handbook. Higgins JPT, Green S, eds. Cochrane Handbook for Systematic Reviews of Interventions. Version 5.1.0. Cochrane Collaboration, 2011. Available from http://handbook.cochrane.org.
. Data gathered as part of the FDA approval process.The National Academies Press, 2011. US Food and Drug Administration. Drugs@FDA database. Secondary Drugs@FDA database. www.fda.gov/drugsatfda. US Food and Drug Administration. Search for FDA guidance documents. Secondary Search for FDA guidance documents. www.fda.gov/RegulatoryInformation/Guidances/default.htm. US Food and Drug Administration. Manual of policies & procedures (CDER). Secondary Manual of policies & procedures (CDER). www.fda.gov/AboutFDA/CentersOffices/OfficeofMedicalProductsandTobacco/CDER/ManualofPoliciesProcedures/default.htm. US Food and Drug Administration. Good Review Practices (GRPs). Secondary Good Review Practices (GRPs). www.fda.gov/Drugs/GuidanceComplianceRegulatoryInformation/ucm118777.htm. US Food and Drug Administration. Drugs@FDA frequently asked questions. What drug products are in Drugs@FDA? www.accessdata.fda.gov/scripts/cder/daf/index.cfm?event=faq.page#contains. US Food and Drug Administration. Drug approval package: Trelstar depot (triptorelin pamoate) injection (Application No 20-715). www.accessdata.fda.gov/drugsatfda_docs/nda/2000/20-715_Trelstar.cfm. US Food and Drug Administration. Drug approval package: Stelara (ustekinumab) injection (Application No 125261s0000). www.accessdata.fda.gov/drugsatfda_docs/nda/2009/125261s000TOC.cfm. US Food and Drug Administration. Drug approval package: Perjeta (pertuzumab) (Application No 125409). www.accessdata.fda.gov/drugsatfda_docs/nda/2013/125409_perjeta_toc.cfm. US Food and Drug Administration. Good review practice: Statistical review template. 2012. www.fda.gov/downloads/aboutfda/centersoffices/officeofmedicalproductsandtobacco/cder/manualofpoliciesprocedures/ucm313814.pdf. US Food and Drug Administration. Regulatory information: Freedom of information. 2018. www.fda.gov/RegulatoryInformation/FOI/default.htm.